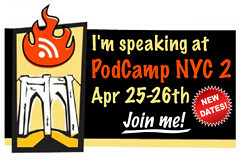 Tomorrow David Gordon and I present at PodcampNYC. We will be presenting about a project we have been working on for months now. I spent some time today finalizing our presentation and realized it will be very difficult to summarize in an hour (from 1-2pm) what has taken us many months to put together. But I am very excited to share what our vision has been to help children, parents, classmates and teachers of children re-entering school after having been treated for cancer. David and I (and everyone else involved with this project) are hoping that after today we’ll be able to forge ahead. Lisa! I wish I was going! 900+ people are registered?!! Insane! Have a great presentation, can’t wait to hear all about it! sorry i did not make your panel, hope to catch up!